Dr. Truszkowkski received his medical education from Oregon Health Sciences University, completed his residency at University of Iowa Hospitals and Clinics, and is certified by the American Board of Internal Medicine, Gastroenterology Certificate. 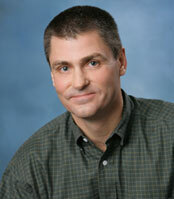 Dr. Truszkowski would like his patients to know that he is just like them, and a regular person. He considers himself thorough and a good listening for patients and is willing to take extra time when it is needed. Outside of work he enjoys biking, skiing, hiking, boating, gaming and gardening. He is also a big supporter of his wife's volunteer work promoting gun sense and safety. Dr. Theivanayagam received her medical education from Rajah Muthiah Medical College, completed her residency at OSF Saint Francis Medical Center, completed her fellowship at University of Missouri School of Medicine and is certified by the American Board of Internal Medicine, Gastroenterology certificate. Dr. Getachew received his medical education from the University of Wisconsin, completed his residency at University of Texas School of Medicine completed his fellowship at University of Texas Southwestern and is certified by the American Board of Internal Medicine, Gastroenterology certificate. Abby received her medical education from Des Moines University and Mt. Mercy University, and is certified by the National Commission on Certification of Physician Assistants. Abby believes that Mercy Gastroenterology has many friendly and knowledgeable providers who are able to get you in quicker than most hospitals for appointments and endoscopies. Outside of work she enjoys spending time with family, runningand attending sporting events. What she would like her patients to know about her is "I am a compassionate provider who spends time with patients and listens well."